Sir Bernard Docker, a flamboyant millionaire, became chairman of Daimler Motor Cars in 1940. Docker married Lady Norah Collins in 1949. It was Norah's third marriage (the previous two were also to millionaires - one was the Chairman of Rolls Royce). Norah had also been a successful dance hall hostess and one-time dancer at the Cafe de Paris. Lady Norah took an interest in her new hubby's companies and became a director of Hooper, the coachbuilder. Norah told her husband that only Royalty knew about Daimlers and that they could not survive on status alone but needed to sell to the masses. She took it upon herself to raise the company's profile and encouraged Sir Bernard to produce more opulent show cars. She designed her own car and had it covered with 7,000 gold stars, with all the bright work gold-plated and garnered headlines in nearly every paper in Britain and across the world. Many considered the showcar to be quite vulgar. But that didn't stop Norah. For the 1952 show, Daimler produced The 'Blue Clover' - a two-door coupe. The gold finish was forsaken and replaced with chrome on a body painted in powder blue and gray, with a four-leaf clover design dotted all over. Inside, the finish was in gray-blue lizard skin. A 1953 car, called 'Silver Flash', included gold fleurs-de-lis on the sides, gray-blue lizard skin interior panels, rear opera-style seats and bulletproof side windows. The 1954 car, 'Stardust', was finished in Royal Blue and covered in miniature stars. The upholstery and trim was in silver silk brocatelle specially made on hand-looms with pale blue crocodile skin being used for the trim caps and cabinet work. The gilded Daimler DK400 coupé was created for the 1955 London Motor Show by Lady Norah and cost £12,000 - eight times the price of a Daimler Conquest saloon. 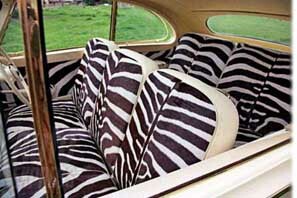 It was called the Golden Zebra - everything that would normally be chrome was gold, while the interior was upholstered in real zebra hide. In 1956, Sir Bernard and Lady Docker took the Golden Zebra to Monaco in for the wedding of Prince Rainier and actress Grace Kelly. Such ostentation was considered to be in very bad taste, since England was still constrained by rationing of food, clothing and gasoline. Lady Norah earned a reputation for having rather poor social graces when under the influence of pink champagne, her favorite beverage. She and Sir Bernard were also investigated for failing to correctly declare the amount of money taken out of the country on a visit to a Monte Carlo casino. Norah frequently ran up large bills and presented them to Daimler as business expenses, but some items were disallowed by the Tax Office drawing further attention. The publicity attached to this and other social episodes hurt Sir Bernard's standing - some already thought the show cars were far too opulent and tasteless for austere postwar Britain. Lady Docker defended her cars and behavior thusly, "We bring glamour and happiness into drab lives. The working class loves everything I do." 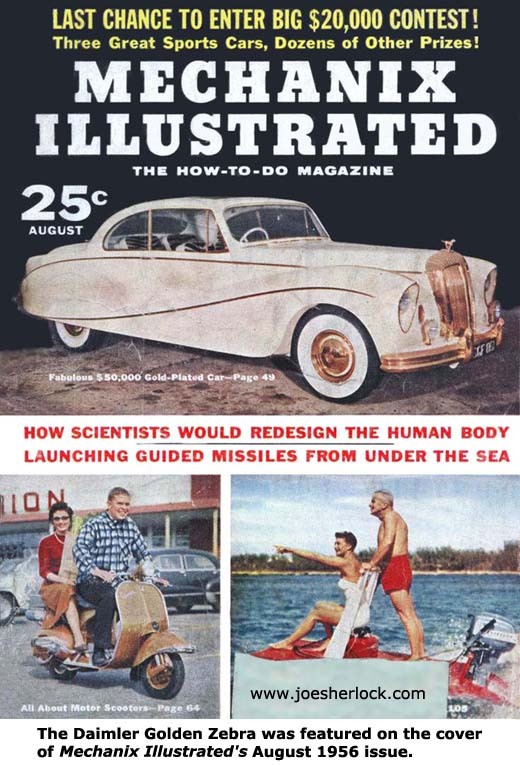 Compounding Daimler's troubles, the royal family shifted allegiance to Rolls Royce. The Dockers were ousted from the board of Daimler in 1956. Exclaimed Lady Docker, "It's not the loss of the gold cars that makes me feel like this. And weren't they fun? They were like my children. No, it's that lovely party I was planning for 25,000 of the company's workers for my 50th birthday. A tiptop affair - and now it's all off. How could they do this to him after 17 years? Why, he's such a hard worker that he had a direct line to the firm from our yacht." Soon thereafter, Lady Docker's antics caused the couple to be banned from Monaco and, later, the entire Riviera. By late 1958, they were reduced to selling Lady Docker's jewelry and, finally, in 1968, their famous yacht, Shemara. By then, they were tax-exiles living in a small bungalow on Jersey in the Channel Islands. If you found this story amusing, you'll probably also enjoy the Chuffley-Waite story.